Sick of the same old lunch options. Sandwich here, salad there. I'm going to suggest something a little out of the norm for a meal. Hummus. Wait, don't shake your head at me so fast. 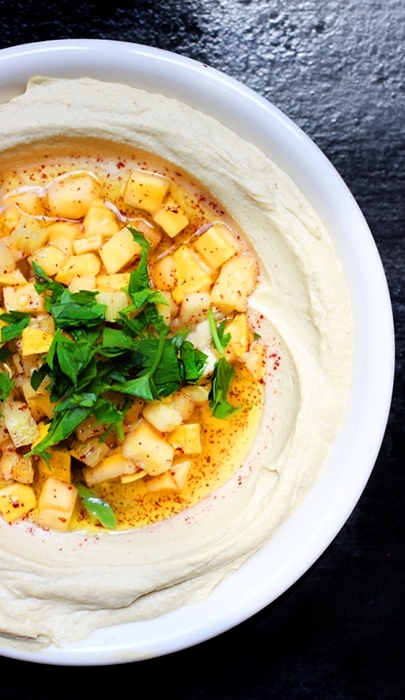 Dizengoff transforms hummus into meals. With rotating menu options that change daily you can expect to find a meat topped hummus option, a vegetarian version and many more. Named after a famous street in Tel Aviv, Dizengoff's first location was opened in Philadelphia in 2014. Now, a second location has popped up in The Big Apple's Chelsea Market. Pull up a seat at their counter for a quick bite with a glass of wine. Or, stop by en route to a friend's get together to grab a high-end hummus to impress them with. Either way, the point is to stop and enjoy!